We were a group of 9 people and everyone was super satisfied. 2 nights we spent there. To watch the whalesharks this hostel is absolutely perfect, you are right in the first group and can see these fascinating animals. 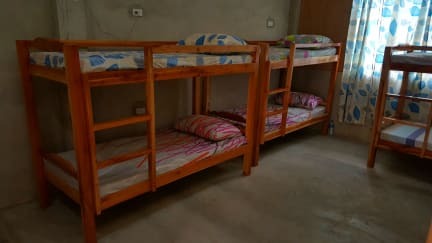 The hostel is in top condition and very clean, the owners are very nice and have arranged for and all trips etc. In addition, they have made it possible for us to order a van for the trip to Cebu City. Only criticism was the wireless unfortunately did not work. Perfect for whale watching 🐳 They bring you on the first boat in the morning! Also not over expensive and you can meet other people there. The staff is really nice and helpful. If you book the whale shark tour with them your one of the first ones who enter the water which is pretty cool because it can get super crowded! The lockers are actually almost completely broken so you can’t make sure your stuff is safe but it’s still safe if you trust your dorm mates. Für eine Nacht und das Whaleshark-Watching am nächsten Tag war das Sharky Hostel perfekt! Es ist direkt am Startpunkt für die Boote gelegen und wenn man es über das Hostel bucht, bekommt man direkt das erste Boot. Das Zimmer war sauber, auch die Toilette wurde auch mehrmals gesäubert. Direkt vorab, die Lage zum Whale shark snorkling könnte nicht besser sein, und die Mitarbeiter tuen alles, damit man als Gast morgens im ersten Boot sitzt. Dafür ein dicken dickes Dankeschön. Trotzdem ist der ganze Ort einfach nicht schön, dafür kann aber Sharkys nichts. Es ist und bleibt Massentourismus dort und so verhalten sich auch die meisten. Der Bungalow war zweckmäßig für eine Nacht. Am frühen Abend lief beim Nachbar mega laut Musik, so dass an früh schlafen gehen nicht zu denken war. You get what you pay for. 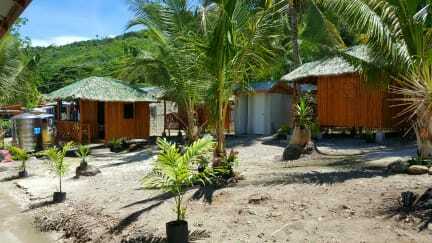 Convenient for one night for doing the whale shark watching tour. But wouldn’t recommend to stay longer. Staff wasn’t really helpful nor friendly. The hostel was ok, but don‘t book the boat from Oslob to Alona Beach (900 Pesos). There is no boat!!!! The boat goes to momo beach. Its way to expensive!!! Der einzige Vorteil der Unterkunft ist, dass man das erste Boot bekommt das zu den Walhaien rausfährt. Ansonsten lohnt es sich aber nicht dort zu übernachten, die Mitarbeiter und die Hostelbesitzerin sind sehr unfreundlich sobald man nicht irgendeine Tour bucht oder in irgendeiner Form Geld dort lässt was über die Übernachtung hinaus geht. Man kann kaum schlafen da es umgeben von Hühnern und Hunden ist. Ab 4 Uhr ist es quasi unmöglich schlafen zu können. Sehr unfreundliche Mitarbeiterinnen. Lärm morgens ab halb fünf durch die Hühner und aufgedreht Musik. Habe deshalb auch die 2. Nacht storniert. Leider keine Rückzahlung erhalten. Worst Hostel ever. Really dirty, unfriendly staff, no atmosphere at all. They don't care about anything. The only reason to stay is because of the whale sharks, but next time I would try to find another place. Dear Hostel staff, at least you could provide toilet paper and clean the bathroom! Even if the guest only want to see the whale sharks! There's so much more to see there, but I would't stay there one hour longer then I have to!! We left straight after the snorkelling. It's a pity!